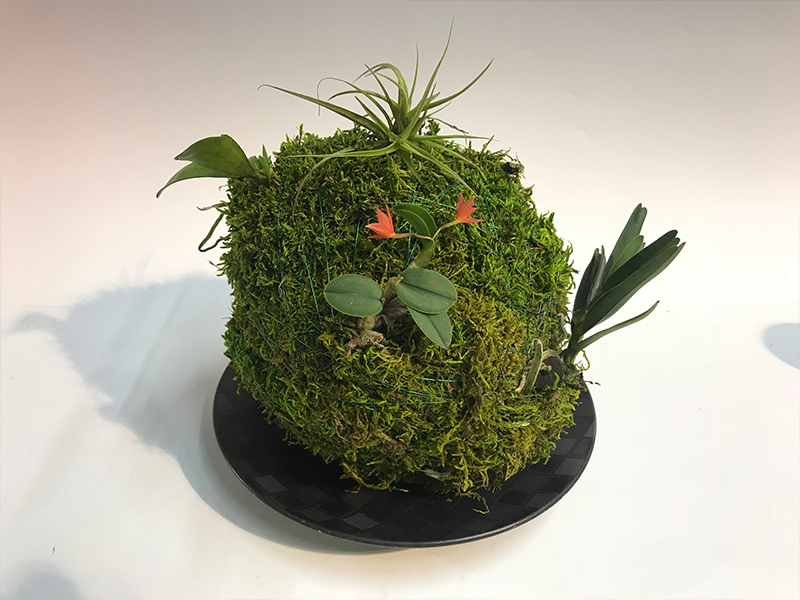 How to make 'Kokedama' for Epiphytic orchids , the Japanese potting technique. 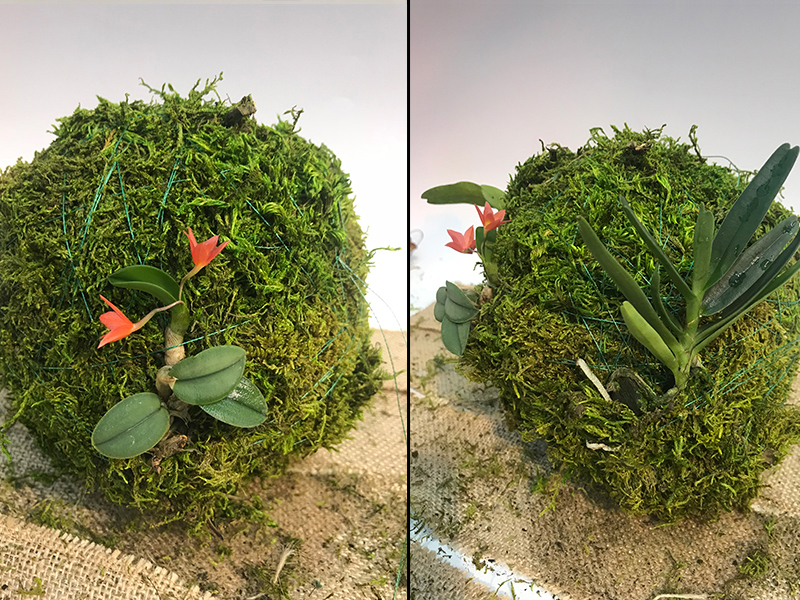 Photos of kokedama hanging on banana baskets from John D'Agostini of Invictus Leadership And Sports Training. I wanted to share a fun craft/project for you to try if you’ve ever been interested in growing epiphytic slab orchids but thought your environment did not have the humidity for it. It’s a Japanese potting technique more are becoming familiar with called ‘Kokedama,' which literally translates to ‘moss ball.' Originally, this technique was created for terrestrials (ground-growing orchids), but can easily be modified to be used for epiphytes (tree-growing orchids). Typically, they are comprised of a water-retaining substrate wrapped in moss. I have taken some photos to go over the process. To get started, you’ll only need a few things. 2) Moss. 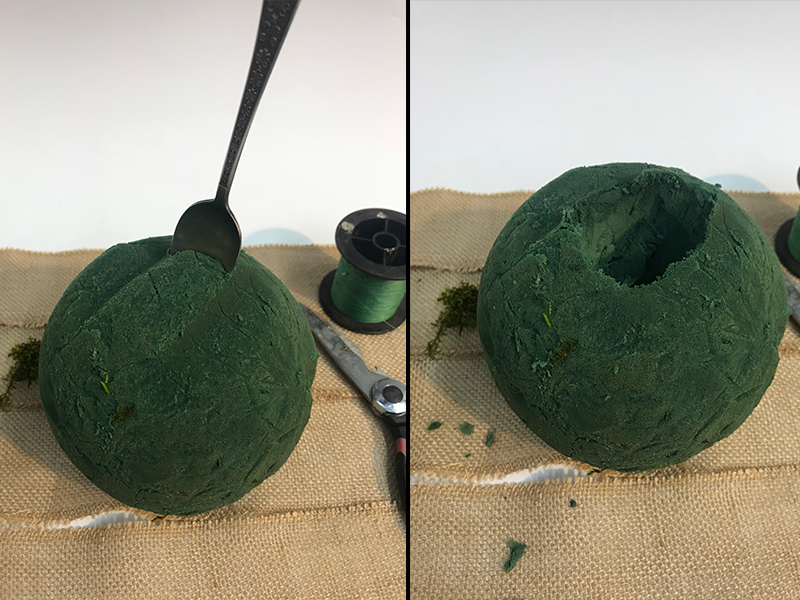 I recommend preserved (dyed) sheet moss or something similar. Orchids actually enjoy these types of mosses and grow quite well on them. 3) Tinted fishing line. I like to use green to match the color of the moss. Step 1: Bore out the top of the floral foam with a spoon. It’s easy to dig into, and you want to create a hole that water can pool up in so that it can wick into the foam well. I usually carve a 2.5” x 2.5” hole or so. 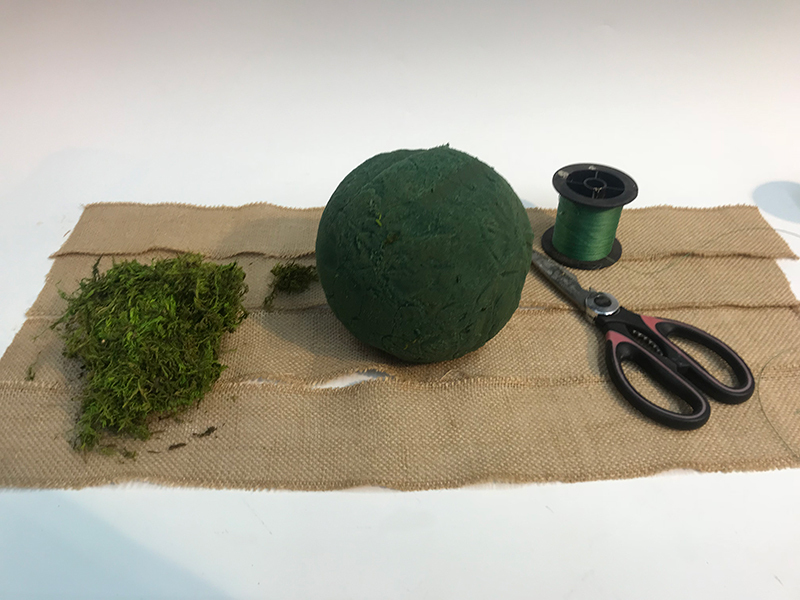 Step 2: Lay over the sheet moss, sheet by sheet, and wrap and double-knot tie the fishing line until you have covered the entire ball. You’ll need to wrap around with the fishing line several times to keep all the moss in place. 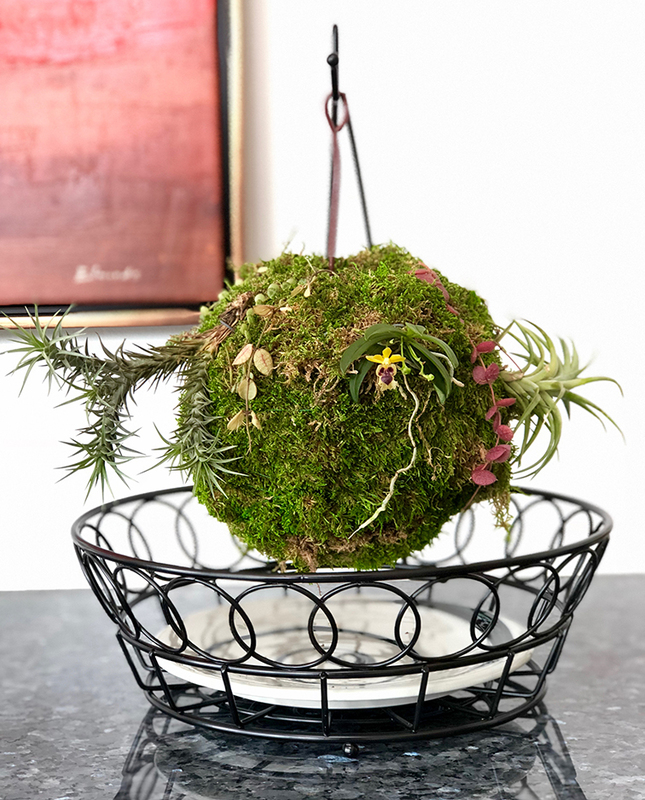 Step 3: Bare-root your epiphytic orchids of choice and place them on the moss ball. Make sure you know what direction the plants naturally grow. Some epiphytes grow upright, and some grow pendulously. If you don’t know, and the orchid is a species, search online for the orchid name, followed by ‘in situ’ to see photos of the species growing in the wild. 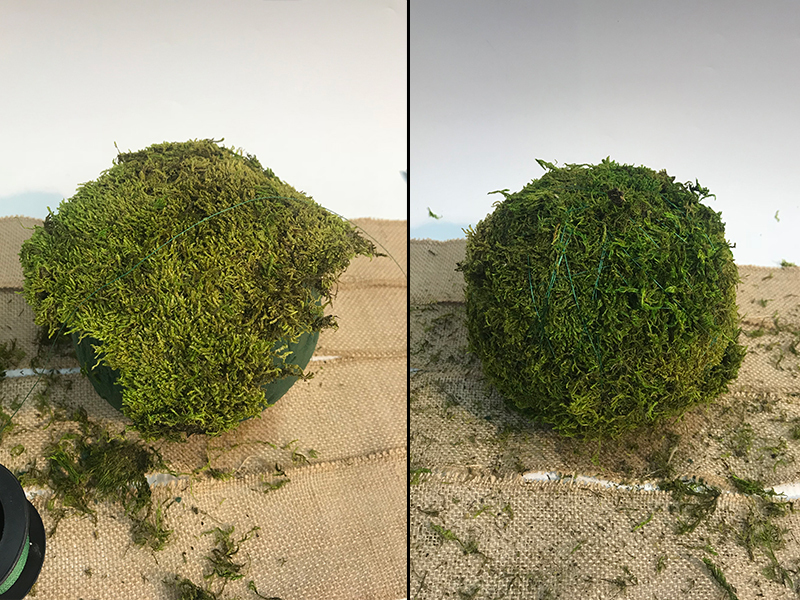 Step 4: Add a small extra amount of the sheet moss to cover the root system, then use fishing line again to wrap around the moss ball. Choose plants that will not outgrow the moss ball too quickly. 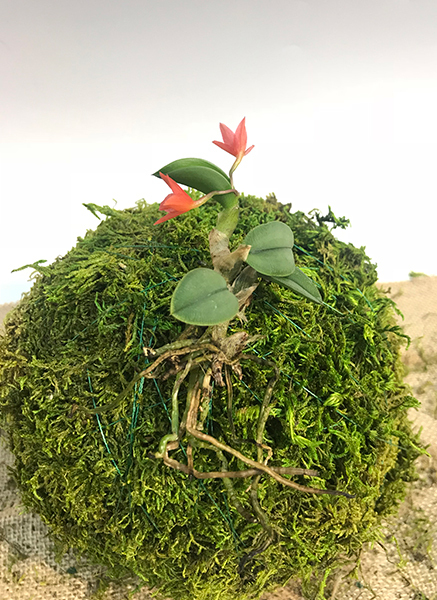 I will put a list of plants below that have done quite well for us on these kokedama at the end of this blog. Step 5: Place the kokedama onto a decorative saucer/plate and you’re done! Or, if you want to hang the ball, use a thick wire with the base bent (see photo) to hold the kokedama in place. Just push the straight end through the bottom, then cut to desired length and bend it over to make a hook. The great thing about this arrangement is these units are very low maintenance! The moss breathes well, being on the outside, and will not rot easily. The oasis foam fiber on the inside holds good moisture but breathes well, keeping bacteria/fungus from being able to establish. Depending on your environment, these may need water every 3 to 5 days on average. Once the plants are established with larger root systems you will need to water more often. All in all, this is a very aesthetically pleasing way to display and grow your orchids. Do you want to see us build these and offer them for sale? Let us know as we are interested in your feedback! Or, would you like to see a step by step video made on how to create a kokedama? Again, let us know! Feel free to e-mail me directly. I have found over time that thick -eaved epiphytes, or pseudobulb epiphytes tend to do quite well on these. If you are looking at mounting soft-leaved orchids without pseudobulbs, these units should have high humidity (75% plus), but for the average consumer growing in a window or under lights in a household, these are highly recommended! Click here to browse our miniature orchids selection. Hope you enjoyed this blog and happy growing!